Carolina Porches is a series of three paintings depicting front porches in Eastern North Carolina. A porch, over time, becomes a reflection, a portrait if you will. In this series I was inspired by this concept. The individuality and uniqueness of each porch portrayed causes the scene to develop into a personal story. Here We Sit is a still life of five different chairs spaced neatly apart, each entirely different than the one next to it. The chairs have their own personality and idiosyncrasy, reflecting the diversity prevalent within each individual as well as between the collective. Despite each chair’s difference all face the viewer stoically, creating a sense of unity. My Father’s Drink at first glance appears to be “just another pretty painting” of a rocking chair and a child’s toy. With a closer look the composition illustrates the destruction and scars that form within the lives of individuals involved. A Shadow in Time reflects the worn, abandoned, and weathered. Despite harsh settings and the reality of change, a beauty emerges from within the rips in the fabric and the crawling vines. My Father’s Drink at first glance appears to be “just another pretty painting” of a rocking chair and a child’s toy. With a closer look the composition illustrates the destruction and scars forming within the lives of the individuals involved. 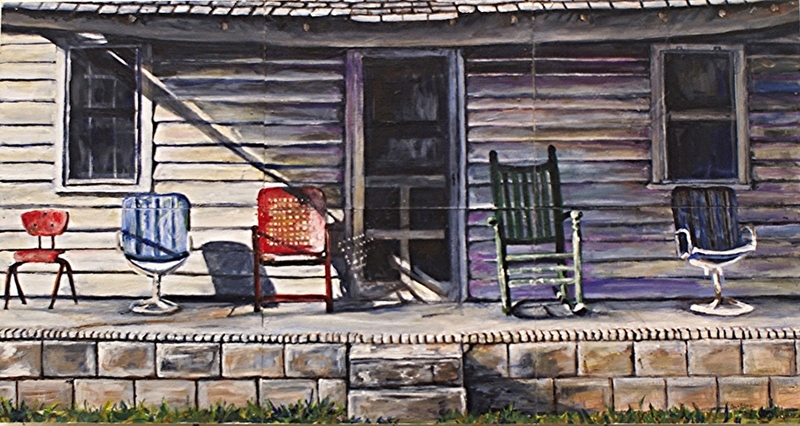 Carolina Porches is a series of three paintings depicting front porches in Eastern North Carolina. A porch, over time, becomes a reflection, a portrait if you will. The individuality and uniqueness of each porch portrayed causes the scene to develop into something more than an extension of a house, it causes it to become a personal story.